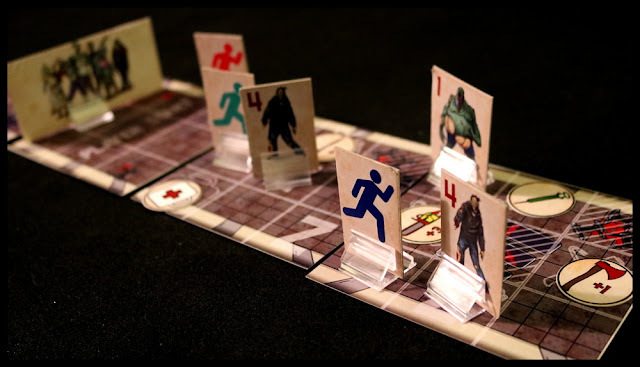 Dead Sprint is a tile-based board game that tasks 2-5 players with outrunning a horde of undead throughout the game while also avoiding/combating the undead in front of them. 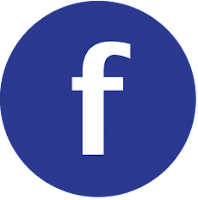 Players will utilize special items to help them along the way, including first aid kits to survive attacks, weapons to improve their attacks, and Action cards they can draw that changes up the strategy for every player. The game features special types of undead that will force the players to decide how best to deal with them based on their inventory. The horde will consume any undead left behind to catch up to the players. The first person to find the exit or the last person to not die is the winner! 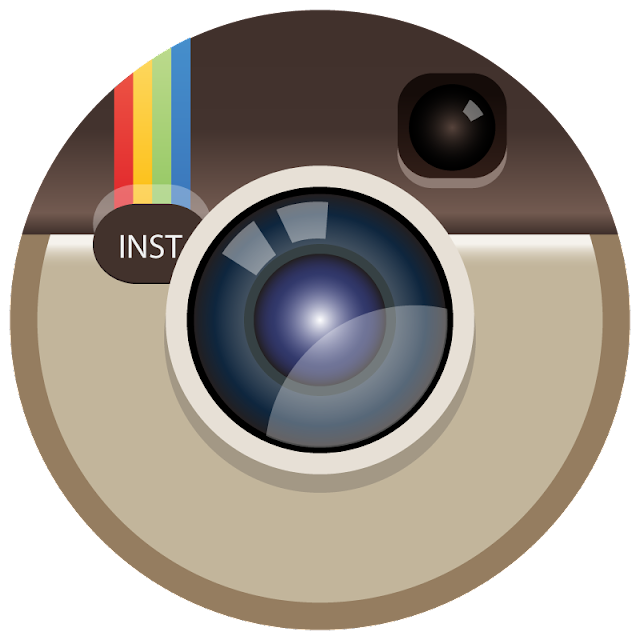 WARNING: This is a preview of Dead Sprint. All components and rules are prototype and subject to change. 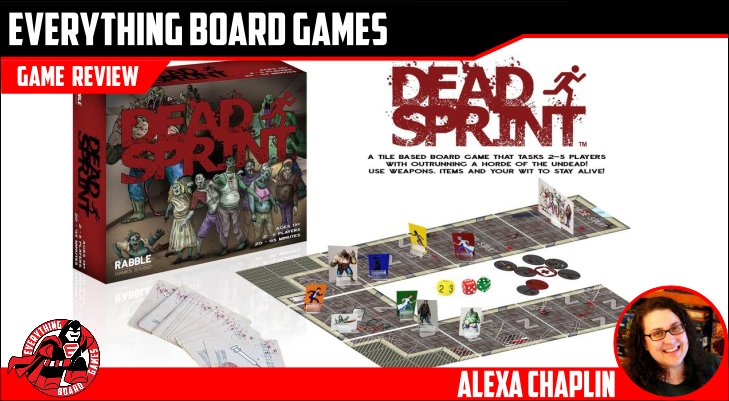 Dead Sprint is expected to launch on Kickstarter later this summer. Run, run, as fast as you can! Be faster than your friends, or you'll be eaten by the zombie horde! 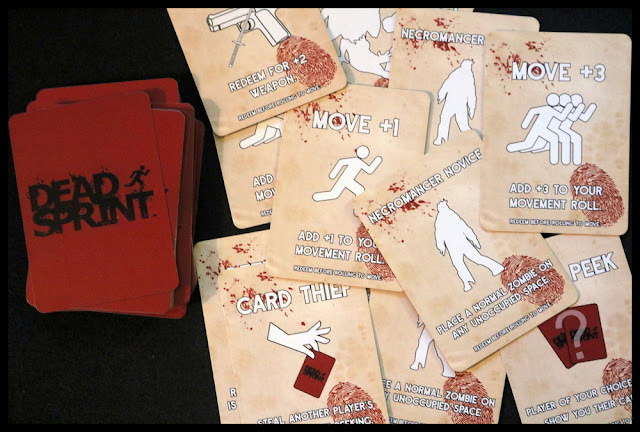 Dead Sprint features zombies that are just creepy enough (without over-the-top gore) and a dice-rolling, tile-flipping, grab-the-weapons race. 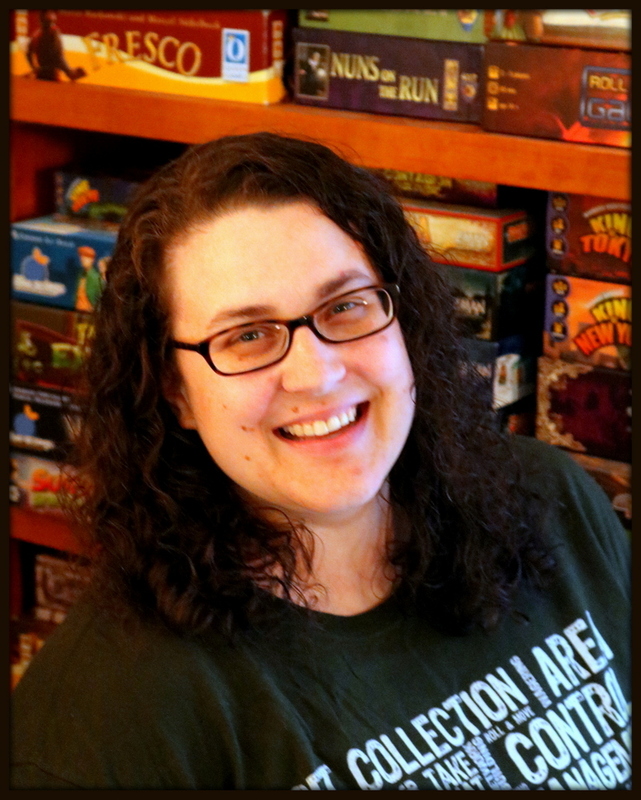 The first player to the exit - or, more often, the last player surviving - will be the winner! 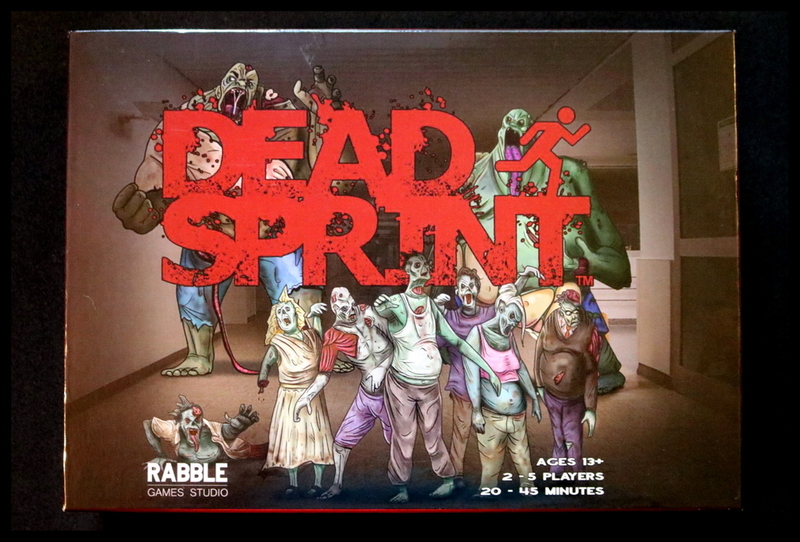 Dead Sprint contains 36 floor tiles showing the interior of a zombie-filled hospital, which you'll uncover as you run away. 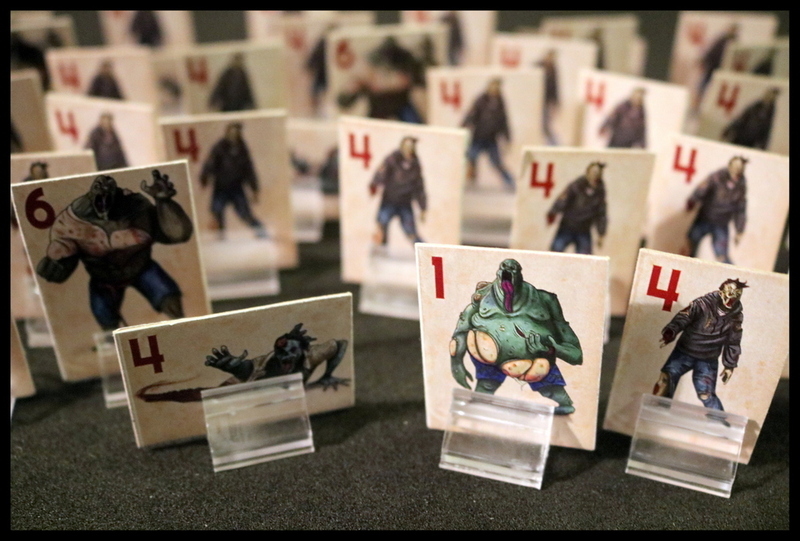 Your character is one of five colored running-stick-figure standees, and you'll be fighting any of the 66 zombie standees. Also included are three dice for moving, fighting, and moving the zombie horde, 90 tokens showing items you can pick up and use, and 54 cards to give you extra advantages along the way. My copy was a well-prepared prototype, but still a prototype, so keep that in mind as you're perusing pictures of the components. In addition, I found the rules to be a little dense, but I believe that was just to fit them on a single sheet of paper for prototype purposes, and I expect the final rulebook to be different. Setup is pretty simple - set out all the pieces, and give the deck of cards a shuffle. Put out the Horde Start and Player Start tiles, mix the Exit tile into the tile deck (put it farther down for a longer game or higher up for a shorter one), and you're ready to run! Dead Sprint is - as its name implies - a RACE. 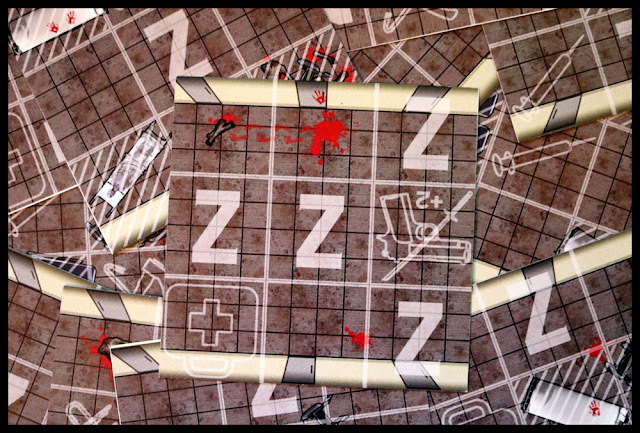 Each turn, you will roll a die to move as far as you can, fighting zombies in your path and flipping over a new floor tile when you get to the end of the old one. After each player has had a turn, the Horde will move. The first player to reach the exit - or the last player standing - wins. Mechanically, the gameplay is pretty smooth. 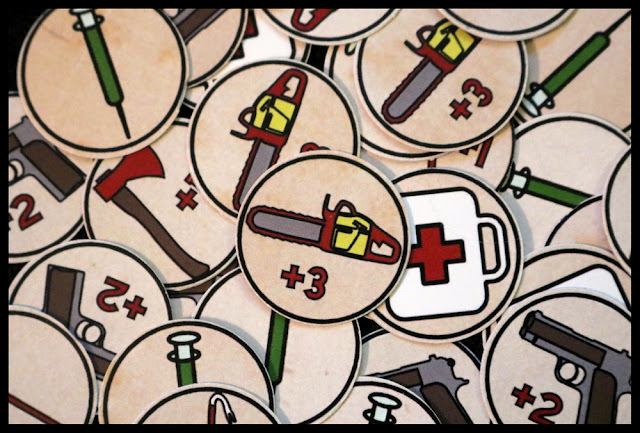 Besides just rolling and running, you can pick up weapon tokens (to help you in combat), health tokens (to keep you safe from zombie attacks or give you a boost of adrenaline to keep running), and Action cards (to give you all kinds of different bonuses). Each time you reach the end of a tile, you'll flip over a new one and stock it with the appropriate weapon or health tokens (printed on the tile) and add zombies - you get to add one special zombie of your choice, and the other "Z" spaces are filled with normal zombies. The zombies themselves are well-fleshed-out (groan!) and have different looks, hit points, and special abilities. 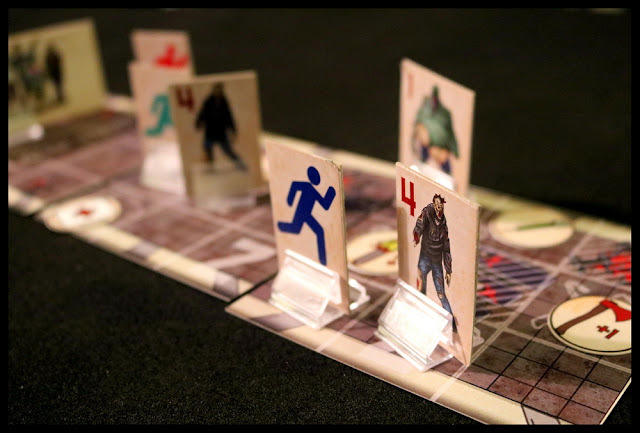 They add a ton of character and a splash of strategy to the race, as you get to decide which one you will put on the tile you add. 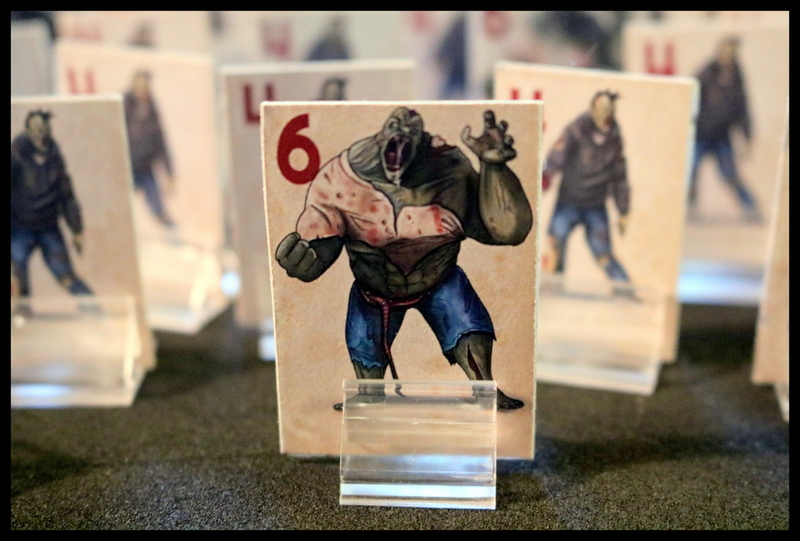 When you run up against a zombie blocking your path, you'll have to fight it by rolling the red die and trying to match or beat the zombie's HP number. If you can't, you can use a weapon or two to increase your hit number, but if you still can't match it, the zombie will attack you. If you have a first aid kit token on hand, you can heal from the attack, but if not... you die! 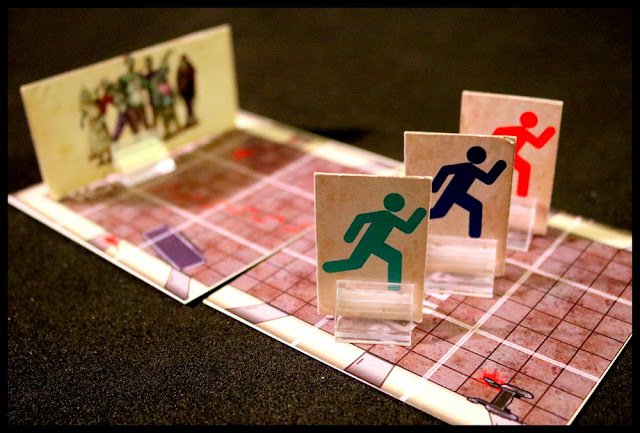 This leads to a good amount of strategy in using up your valuable movement points to step onto squares containing weapons or health tokens, or to running around zombies that you think you couldn't beat. The Action cards come into play, too, sometimes giving you extra movement or extra tokens, and sometimes letting you slow down your opponents or put more zombies in their path. As the game progresses, you'll find yourself dodging zombies more than fighting them, and leaving more zombies behind you as you try to dash through the hospital hallway. Unfortunately, this lets the Horde get faster and faster - as they move, each time they catch up to a zombie still on a tile, they get to move one extra space that turn (absorbing the lone zombie into the Horde). In the later part of the game, this can really mean some super long moves for the Horde, making them ever closer to catching you! If you encounter a zombie you can't kill and can't heal from, get damaged by a "Sploder" without having a first aid kit, or get caught by the Horde, then you die. The last person standing - or in the case of really lucky runners, the first person to get through the Exit tile - wins the game. 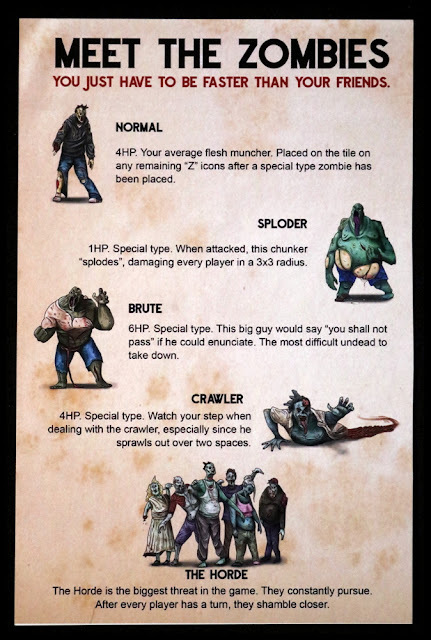 The zombie theme in Dead Sprint is really well done; each of the special zombies has a personality, and the hospital corridor helps keep you contained. The race theme is fun and easy for new gamers to grasp, and we don't have another game that's quite like this one. 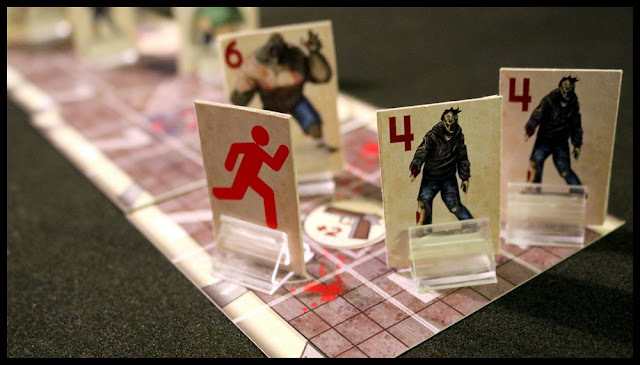 There are lots of zombie games on the market these days, but we haven't played another family-friendly, creepy-without-being-gory, race-to-the-finish zombie game! 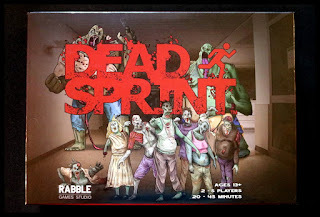 Dead Sprint finds a good balance between being a light game with an easy to grasp theme, and adding enough strategic elements (the zombie placement, the tokens, and the Action cards) to give experienced gamers a little something to sink their teeth into. 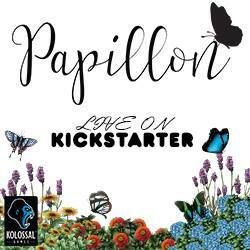 We appreciated the art and the production quality, even of the prototype - obviously, the designer and publisher have high standards and are expecting to make a well-polished and carefully crafted game. Some of our players (especially the younger members) do not enjoy player elimination, and that can happen in Dead Sprint - if one player falls behind and is eaten quickly, they are out of the game and can feel left out or bored as the game rolls on without them. Our solution was to let the eliminated player(s) choose the placement for all future zombies and roll for the Horde each round. This let them stay involved in the game and get a little gleeful payback as they planted Sploders and Brutes directly in our path! 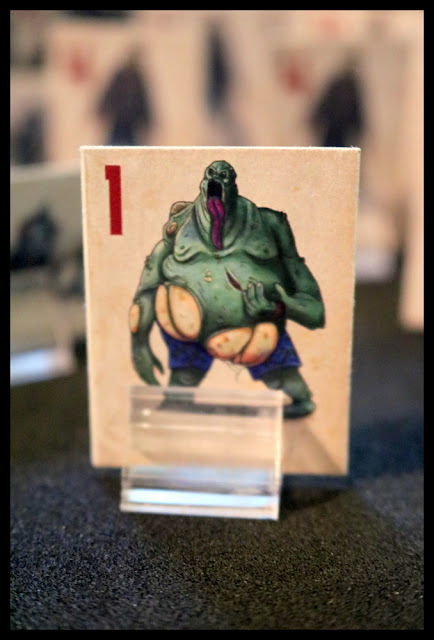 The other issue that we had with Dead Sprint is that it is very possible to have a game cut very short by bad dice rolls early on - if all the runners roll 1's and 2's but the Horde rolls a 3 after each of the first two or three rounds, they are going to catch everyone. Unfortunately, this seemed to happen in almost half the games we played. Maybe we're just super unlucky with dice? 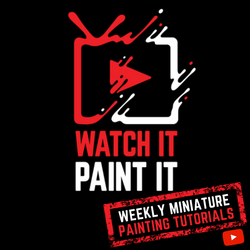 Our players did brainstorm two possible solutions to this - one which is easy to establish as a house rule, and the other which could be added by the publisher or a crafty home player. As a house rule, you could say that until the Horde gets off their starting tile (or the first two starting tiles, to make it even easier), they will only move 1 space per round, rather than rolling the die. This gives the runners a little bit of a head start in case of bad movement rolls early on. A more official solution (or one for crafty folk) could be to have different dice available for the Horde movement: the current 1-1-2-2-3-3 for a Normal Mode game, a 1-1-1-2-2-3 for an Easy Mode, and a 1-2-2-3-3-3 for the Difficult Mode. 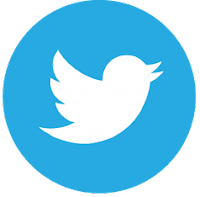 Of course, the easiest solution to a quick-lose game is simply to start over and play again immediately, since you already have the game on the table! 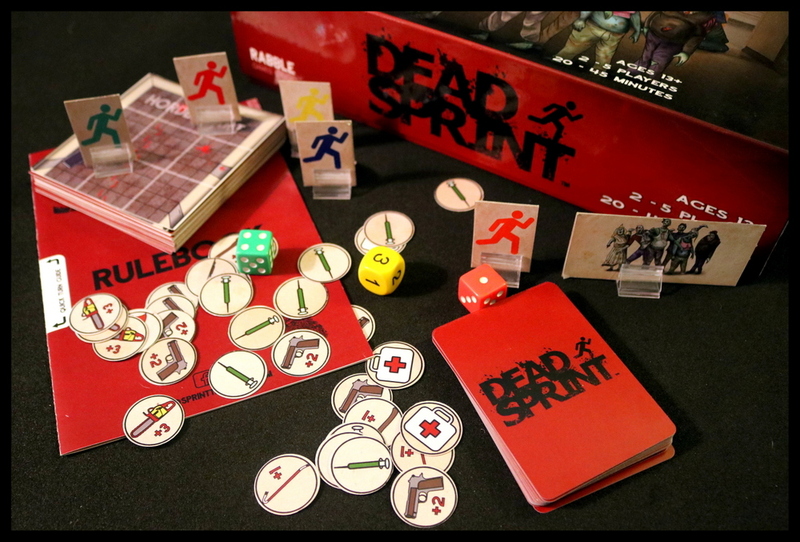 Dead Sprint is a good fit for players who like racing games such as Camel Up, RoboRally, or Techno Witches. 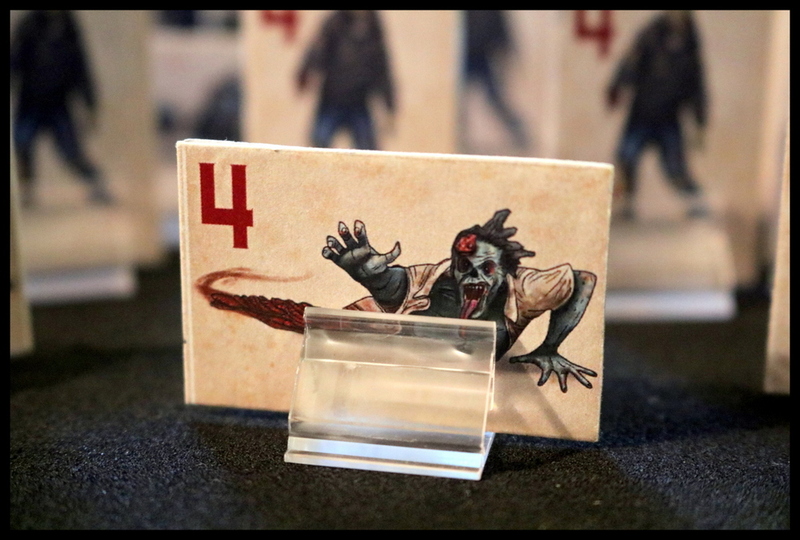 Obviously, it will also be a draw for zombiephiles who enjoy games like Escape: Zombie City, Zombicide, or Zombies!!! You don't have to be a racing expert to win Dead Sprint - you just have to be faster than the rest of your friends! Dead Sprint is a fresh new entry into the zombie genre, crossing survival and combat with an ever-more-frantic race to the exit. We enjoyed it!